A winner of more than 70 international or national racquetball titles and six United States National championships during his dominating 14-year professional career, Marty Hogan was ranked either #1 or #2 in the World from 1976 to 1990. Marty won the U.S. National Championship five consecutive times, 1978 to 1982, and in 1986. He was runner-up in 1976, 1977, 1983-1985. From 1978 to 1981, he reached the finals of 62 consecutive tournaments, winning 56 of them. St. Louis-born, San Diego-raised Hogan revolutionized the sport of racquetball, changing it from a “control” game into a “power” game. He is an athlete who competitors say is able to jump both horizontally and vertically at the same time, while driving a ball as fast as 142 miles per hour. Marty turned pro in 1975, and became racquetball’s first millionaire. At the time of his retirement in 1990, he was the sport's all-time leading money winner. 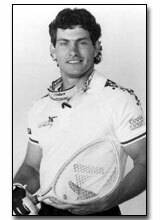 In 1989, he captured his final national racquetball title, and retired the following year. National Racquetball Magazine ranks Marty the #1 player of all-time.